Chile's Patagonian region stretches from Puerto Montt to the Antarctica on the extreme south, with stunning landscapes that include beautiful forests, islands, fjords and icefields. The first Europeans to lay eyes on this landscape were led by Ferdinand Magellan, who pioneered passage through the treacherous strait that now bears his name. Patagonia lies in the far south of Chile and Latin America and is world famous for its impressive scenery and incomparable tourist attractions. This immense territory is best understood as two distinct regions, separated by the vast expanse of the Southern Patagonian Ice Field. Northern Patagonia is one of the world's last great expanses of wilderness, accessed by a gravel highway known as the Carretera Austral, completed in 1988. The Austral Road, which can be found in the northern half of the region, is unpaved and weaves itself through virgin forests, stunning glaciers, rivers and icefields. Even today, road access to the region is not complete, and travelers on the Carretera Austral must hop ferries across the mouths of the great fjords. The port of Puerto Montt’s Chaitén provides access to the northernmost portions of the Carretera Austral, including truly world-class rafting and fly fishing as well as cruises to glaciers and island hot springs. On the northern shore of the Magellan Strait is Punta Arenas, the capital of the Magallanes province and the main starting point for cruises or flights to Tierra del Fuego, Canal Beagle, Isla Navarino, Cape Horn and Antarctica. The indigenous groups who inhabited Tierra del Fuego were the world's first and greatest adventurers. In arriving on Tierra del Fuego they had completed the world's furthest human migration, arriving finally at the very end of the earth, where the Andes disappeared into the sea, and glaciers flowed to the water's edge. To the east of the Andes, the Patagonian pampa is an immense desert, by some accounts among the five largest deserts in the world. West of the Andes is another world. Here both the Central Valley and the Coast Range have sunk into the Pacific; what were once glacial valleys are now fjords, and what were once mountaintops are now islands. Hot springs lay revealed by coastal erosion, while great glaciers further fragment the landscape. Southern Patagonia, known as Magallanes, is a world apart, where the broad expanses of the pampa meet with the glacially sculpted spires of the Andes. 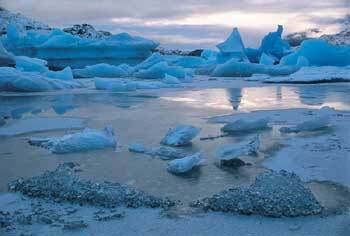 The polar climate begins in the icefields of Aisén and Magallanes. Torres del Paine National Park and World Biosphere Reserve is the most famous of the vast protected areas in Magallanes, preserving habitat for guanacos, foxes, rheas and flamingos. South of the park is Puerto Natales, terminal for southbound ferries to hiking, horseback trips, glacier cruises, and overland trips. Chile is one of seven countries worldwide, from both the northern and southern hemispheres, to claim a portion of Antarctica as national territory. A visit to the most remote of the seven continents is an experience of a lifetime. It is a moving setting where only the blue sky contrasts with the immensity of the snow and ice floes. The territory can be reached by sea and air from Punta Arenas. The best time to visit is during the Austral Summer (December to February), when the days are long and daylight stretches well into what should be night. Then there is enough light and time to admire the colonies of the seven species of penguins, and to glimpse the whales on their journeys through Austral waters. The Antarctic Peninsula, which stretches north like a finger pointing toward the famous Cape Horn, is the northernmost and consequently warmest portion of the continent. Nine countries have research stations on the Antarctic Peninsula and its outlying islands. Geologically, the Antarctic Peninsula is closely linked with southernmost continental Chile. South America and Antarctica were neighbors on the ancient continent of Gondwanaland until some 27 million years ago, when the formation of the Drake Passage definitively separated the two continents. Antarctic plant fossils from the Pilocene indicate the presence of a temperate ecosystem similar to Patagonia. The region’s unique features make the territory of the South Pole an especially attractive destiny for those who have traveled extensively. Only here will the experienced traveler and those with the spirit of exploration have the privilege of experiencing first-hand what has been described as the coldest, driest and windiest place on earth. It is worth remembering that in 1969 a temperature of minus 88.3 degrees Celsius was recorded at the Vostok base. This has proved to be the lowest temperature so far recorded anywhere in the world. The world’s largest freshwater reserves are contained in Antarctic Ice, which averages 6,500 feet deep and in places reaches up to 13,000 feet deep. Flowing from the center of the continent to its edges, the ice forms huge shelves, which extend for miles into the surrounding ocean. Cruise ships pass along the leading edge of these shelves and treat visitors to the spectacle of huge chunks of ice ‘calving’ off these 150-foot high walls of ice. The glaciers can be admired up close and the scene is unforgettable for those witnessing the huge blocks of ice breaking off and crashing into the lake with a thundering sound, breaking the unnatural and eerie silence. There are beautiful icebergs, which float on the lagoon, and it is possible to sail among these floating ice castles that reveal only a tenth of their actual size. The very brave may wish to approach them in small boats and have a glass of whisky with cubes of thousand-year-old ice, while admiring their various shapes and the unforgettable translucency of their colors. Antarctica is the only place on Earth where there are more penguins than people. It is a place where sea lions and seals relax on floating ice while whales swim in their midst. Without a doubt one of the biggest attractions of Antarctica is to see the blue whale up close, the world’s largest animal, while it feeds on the krill in the Austral waters. The movement of the whales among the icebergs and the rhythmic sound of their water jets will leave you speechless and will etch this white and lonely landscape at the end of the Earth in your memory forever.